The program of Bachelor of Science in Psychology was also re-surveyed for the compliance of certain areas that were accredited in the previous visit. The team was headed by Dr. Adela J. Ruiz of Polytechnic University of the Philippines while the members were Dr. Thelma A. Lanuza, Dr. Demeteria A. San Juan, and Prof. Ruvy Tuble. Meanwhile, Dr. Serapio D. Catriciones from Nueva Vizcaya State University served as the team leader of the accreditors who conducted the Level IV survey visit of the program Bachelor of Science in Entrepreneurship. The members of the accreditation team were Prof. Nestor C. Competente from Rizal Technological University; Dr. Carlo F. Vadil of Nueva Vizcaya State University; Dr. Isabelita S. Bacud of University of Rizal System; Dr. Elizabeth E. Polinga of Cavite State University; and Prof. Ruvy M. Tuble. The accreditation team assigned for the program Bachelor of Science in Agricultural Engineering was headed by Dr. Antonio E. Madrid of Don Mariano Marcos State University. The members of his team were Dr. Sanny V. Dangis of Nueva Vizcaya State University; Dr. Carlo F. Vadil Prof. Nestor C. Competente; Dr. Elizabeth E. Polinga; and Prof. Ruvy M. Tuble. Lastly, the accreditation team who had conducted survey visit for the program Master of Science in Agriculture was headed by Dr. Mario B. Mendoza of Don Mariano Marcos State University. The members of his team were Dr. Sanny J. Dangis and Prof. Ruvy M. Tuble. On the first day of the survey visit, the TAU administration and the core faculty of the programs subjected for accreditation welcomed the accreditation team. During the said opening program, Dr. Max P. Guillermo, the TAU President, expressed his gratitude to the commitment and effort of the accreditors coming from various SUCs to visit and accredit the program offerings and the governing system-processes of TAU. He stressed the imminent role of AACCUP in accrediting and maintaining the quality of service, integrity and excellence in all Higher Educational Institutions (HEIs). To initiate development in the community, Dr. Guillermo imparted the significant role of the University in innovating relevant technologies and productive services to its clienteles and community partners, local or international partners. He pointed out that part of the University’s strategic development plan is to consider accreditation as part of the culture in the TAU community. 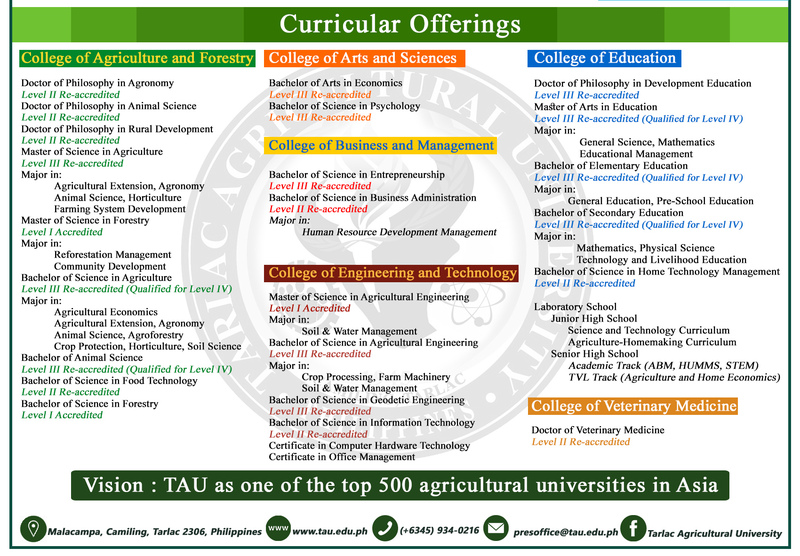 As the University envisions the betterment of the services it provides to all of their clienteles, he added that TAU is now realizing its role in extending the agricultural, technological and socio-cultural development in local level and even to national and into global transformations. Consequently, Dr. Lanuza also expressed her appreciation with regards to the warm welcome and hospitable accommodation provided for them by the TAU community. During the survey visit, the accreditors were ushered to various colleges to conduct class observations, monitoring of system-processes, validation of pertinent documents, checking up of the prescribed infrastructure designs particularly the laboratories, educational and sports facilities, and interview on clienteles, faculty and administrative personnel. After the four-day accreditation, the team presented their over-all impression on the compliance of the University in upholding quality of service and excellence in its program offerings. The accreditors assigned per area also presented the strengths and weaknesses of the programs with regards to the quality of instruction, extension, research, and production. These presentations were held during the exit conference at the Agritourism Hostel on August 31, 2018, Friday.